Chicks in Bowls... On Skates! Willow Parker, 24, being rad. Helmets emblazoned with stickers bob up and down just over a grassy hill in Ponderosa Park, reassuring me that I'm headed in the right direction. 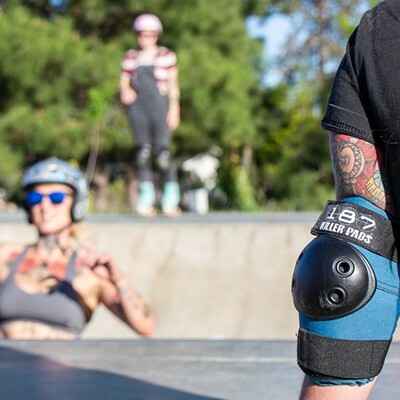 After walking past a gaggle of teenage boys on skateboards sporting bucket hats and Vans, I find a small group of women clad in knee pads, elbow pads, helmets and quad roller skates on a half-pipe at the far end of the skate park. A young girl in roller blades sits nearby on the grass, watching tentatively as the ladies roll up and down the ramps. 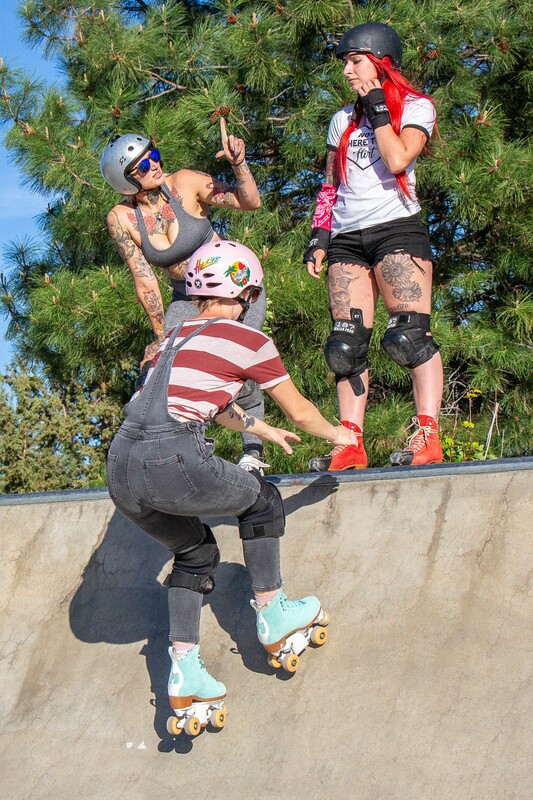 A skater tells her she should get a pair of quad skates and join them. It's not often that you see quad skates outside of roller derby or the roller rink. Willow Parker, founder of the Bend chapter of Chicks in Bowls, wants to change that. "I was in and out of derby for a few years—I'm not super competitive," says Parker, a petite 24-year-old with cropped blonde hair. "I started seeing videos of the Moxi Roller Skate Team on YouTube... I was like, I really want to do that." The Moxi Skate Team is a gang of girl skaters in Long Beach, Calif. that absolutely shred on quad skates. 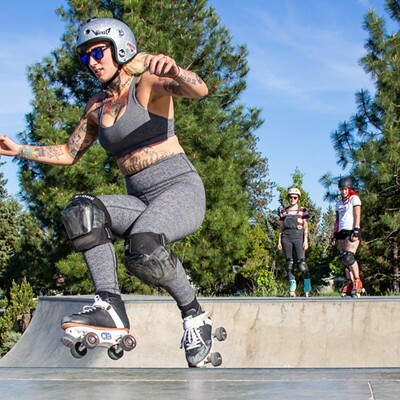 The crew has staked a claim in what have traditionally been male-dominated spaces: skate parks. 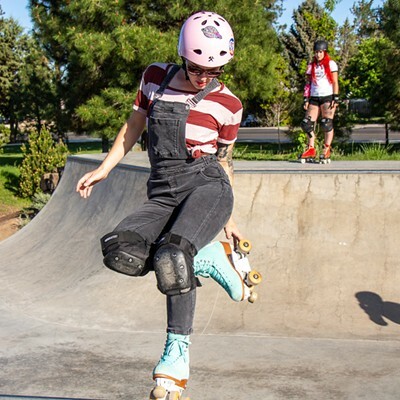 Chicks in Bowls, an online apparel and gear shop with a crew of sponsored female skaters, fosters a community with a similar mission: to encourage skaters of all genders and identities to take to the streets and skate parks on quads. Parker visited the Moxi Roller Skate shop in Long Beach in February 2017, where she bought her first pair of Moxies. 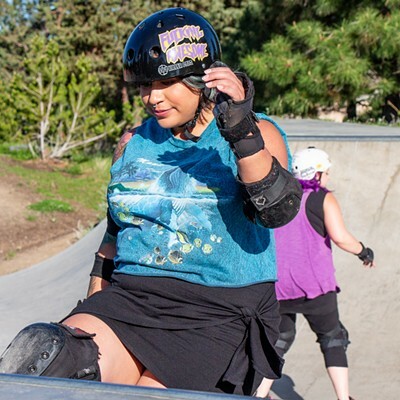 From there, she started hitting the skate parks—alone, at first. "I've never seen any quad skaters in the skate parks around Bend at all," says Parker. "There were always skateboarders, or scooters or bikers in some parks, so I just started going by myself." It didn't take long after Parker started posting videos of herself skating on Instagram for a handful of women to reach out, asking to join her. 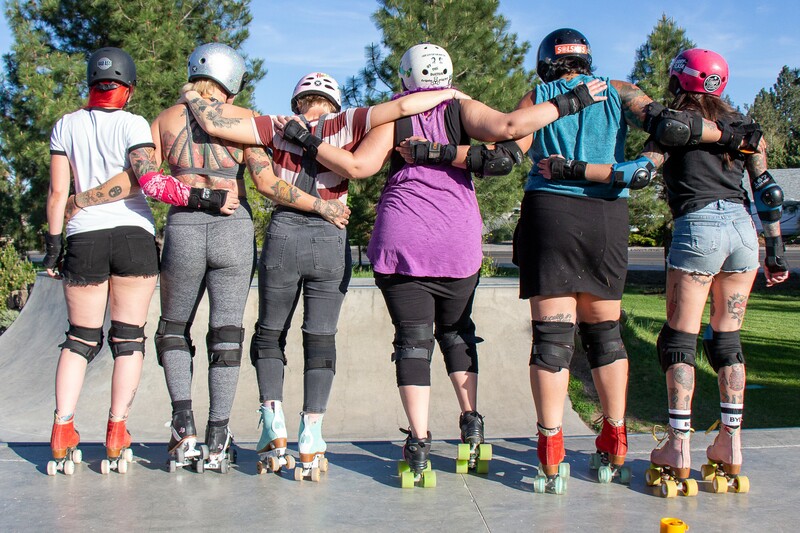 Many of these skaters came from the derby community in Bend. 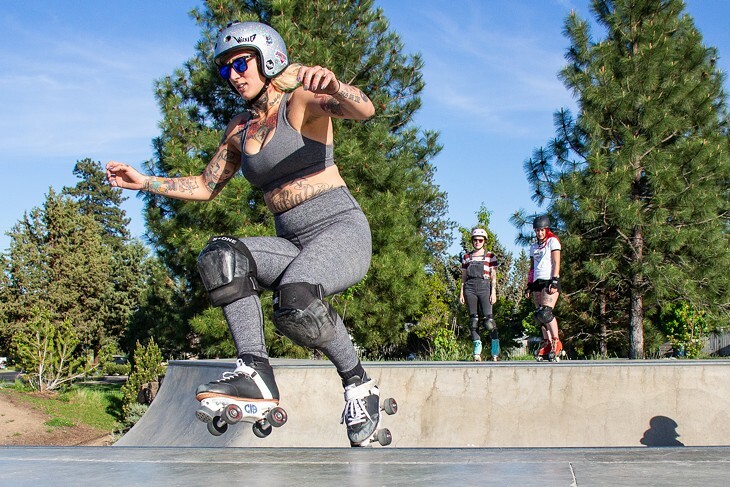 Last year around this time, Serena Zendejas was teaching herself how to stay upright on her skates at Cascade Indoor Sports, but the rental skates were terrible, she says. 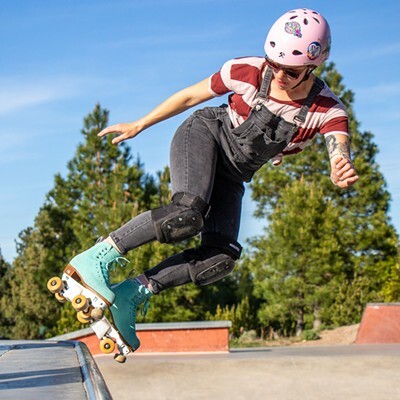 After upgrading to a used pair she found on Craigslist, kismet led her to Parker's Instagram and they started hitting the skate parks soon after. Today, Zendejas wears a pair of pastel pink leather Moxies—her first pair. 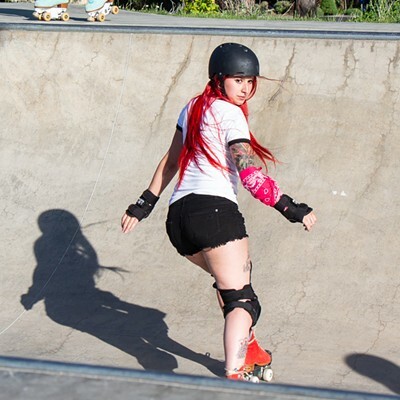 A young woman with long, bright red hair watches Gloria Zef closely as she shows her what form she should be in when she attempts a "plate stall"—a trick that entails balancing the bottom of both skates on the top, metal edge of the ramp—or "coping." Zef founded the Orange County chapter of Chicks in Bowls in 2014. Soon after, she was tapped to join the Chicks in Bowls International Skate Crew, traveling to skate events all over the country. She's currently sponsored by Sure-Grip and Wicked Skatewear. "I don't think I'm that good, but I just think I have a really good attitude about stuff," says Zef. "People really dig that, you know? A positive attitude will get you really far in life." The tall, tattooed blonde goes on to say that every skater is their own worst critic. I would say so. This lady shreds the half-pipe, nailing grabs and jumps—but taking her share of spills, too. "You've got to be a certain type of crazy that wants to do something where you continually fall over and over again," says Zef. "But then when you land it and when you watch somebody get so excited about something that you really love, it makes it all worthwhile." The aforementioned fiery redhead, dropping in on ramps alongside Zef and Parker, is Rebekah Bruce. 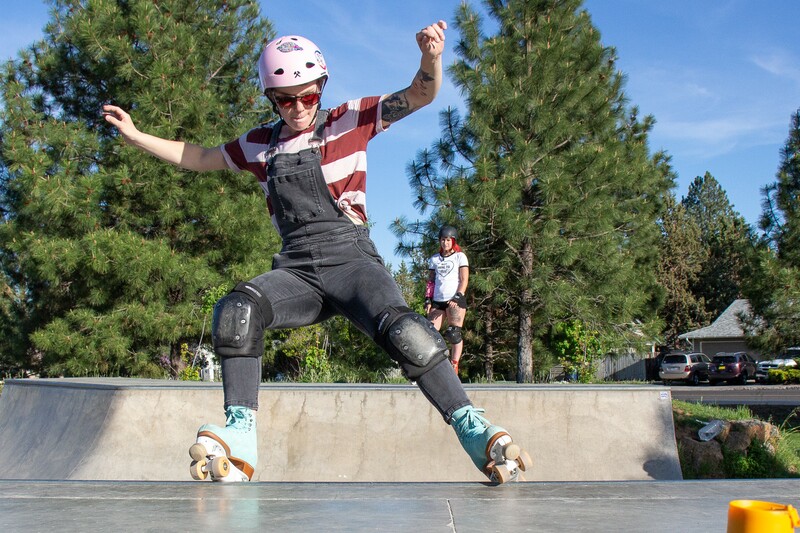 She's been skating with the Bend chapter for about six months. "The whole community around it is really cool," says Bruce. "You can kind of just go anywhere and just message the chapter on Facebook and say, 'Hey, I'm in town, who wants to go to a skate park?'" There are over 250 chapters of Chicks in Bowls worldwide—no small feat. The company was only founded six years ago. Parker hopes to see CIB Bend grow from what is now 10 active skaters into a larger community. Kids, boys and girls are encouraged to come to the meetups with a parent to try quad skating as well. "You never see people sad on roller skates, you know," says Parker. "Everybody is always smiling and having fun." CIB Bend events are family-friendly and meet once or twice a month. Parker suggests skaters have a good grasp of the basics—starting, stopping and good balance—before taking on the ramps. 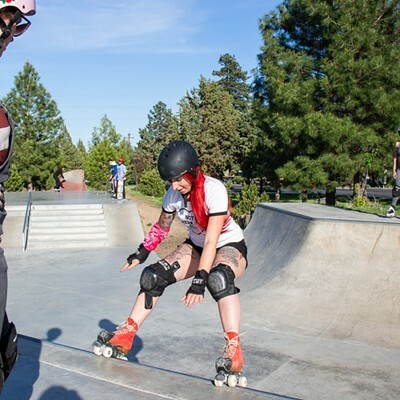 If you have those down, the chicks of CIB Bend will teach you the ropes—or ramps, if you will.